The Digital, Tech and IT Apprenticeship Guide - Which? Introduce your students to the possibilities of an apprenticeship in the digital, tech and IT sector. 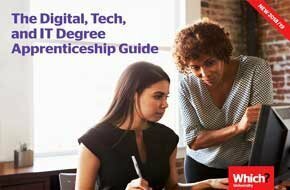 What digital, tech and IT apprenticeships are and what types of degree or higher apprenticeships are available in these industries. The benefits of completing an apprenticeship in these areas, and what future prospects they offer. What real-life apprentices and employers think about apprenticeships in these sectors. How and where to apply for apprenticeship vacancies, plus an example of an apprenticeship recruitment process. Examples of companies and organisations running apprenticeships in the digital, finance and IT sector, with links to useful advice from Which? University. Download our free, comprehensive guide to higher and degree apprenticeships, covering everything from what your students can study to how much they can earn. A free downloadable guide packed with information and advice on higher and degree banking apprenticeships including how to apply to them, and where to find them.